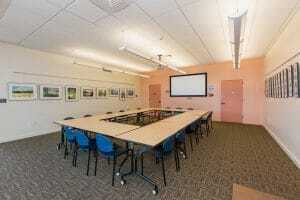 The Jeanne Marie Gaulke Community Meeting Room at the Hood River Library is available for the public to use for meetings and special events. Such use could include nonprofit board meetings, public hearings, concerts and performances, lectures, and much more. Up to 49 people can occupy the room. The room is free for non-commercial use and $20 per hour for commercial use or private use. Commercial use includes selling products or services, fundraising, or events where a fee is charged. Private use includes events for private parties such as closed parties, depositions, meetings with clients, etc. Businesses and commercial organizations may use the Meeting Room without charge for educational and informational purposes or for staff meetings and trainings. The room can be booked up to 6 months in advance. While every effort is made to accommodate use of the room, we cannot guarantee availability for regular weekly or monthly events or events that involve all day use across multiple days. If you’re interested in booking the room, please first read the Meeting and study rooms policy. Then, check the calendar below to see if the dates in which you’re interested are available. Once you determine your dates, fill out the form below to book the room. We like to leave at least a 30 minute gap between appointments, so keep that in mind when requesting times. Need to use the room at a time with the library isn’t open? No problem! We’re happy to check out a key to you, so the room is available anytime. The calendar below shows when the room is being used. Please check the room’s availability, then fill out the application below. We will contact you to confirm your reservation. Please call us with questions at 541-386-2535 or email us at info@hoodriverlibrary.org. If the meeting occurs outside normal library hours (Tuesday-Thursday 10am-7pm, Friday-Saturday 10am-6pm), you will need to check out an after hours key packet in advance of meeting. The key packet will give you access to the meeting room and restrooms. You may check out the packet up to 2 days prior to the event.